As a superhero, Batman is a bit of a loner. Except for Alfred. And Robin. And Batgirl, Oracle, Commissioner Gordon, the Justice League. It appears that Batman is no loner at all, he loves to be surrounded by friends and family (as long as he has an up to date dossier of how to destroy them should they turn rogue). A new image suggests that LEGO Batman is no different and that LEGO Batman 2 may contain more DC heroes than any one supervillain can handle. LEGO Batman was one of the best games in the LEGO series, but many of the unique gameplay aspects were provided when playing as the villains. 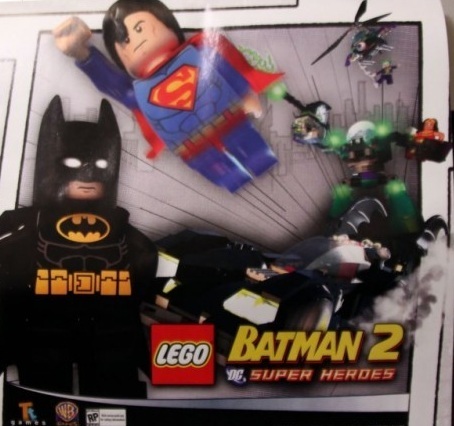 The new image found by Bricktuts hints that the good guys may have more to offer this time around with the likes of Superman, Wonder Woman and Green Lantern entering the fray. As of yet this image is still a rumor and Traveller's Tales have yet to confirm or deny it, but who doesn't want to play as several of DC's massive cannon of heroes: Superman, Wonder Woman, Green Lantern, erm... Tree Boy, Sandwich Thing, Bob the Cleaner and so many more!